My friend Andrew is visiting Bai Hao tea fields in Taiwan as I write this, so it’s small magic that my fiancee, when asked to choose a tea, picked out my bag of 2012 M. Xu Bai Hao (東方美人茶) that I picked up several months ago in Montreal (courtesy of the fantastic folks at Camellia Sinensis). I’ve written about this tea before, but I have to say that this time through I felt as though I was drinking a different tea. The first thing I noticed was the color of the dry leaves themselves. My fiancee did a good job of describing them as “multicolored”. There was bright green, dark green, tan, gold, and dark. It’s rare I’ve seen such a change in hue within one tea, perhaps only in a First Flush Darjeeling with their particular early-season processing that makes for such a nuanced flavor. I tried to capture the colors in a photo. Maybe you can see some of it for yourself. When I poured the first infusion, I was struck by how the liquor reminded me of apple juice, right down the the small bubbles on the surface. It’s possible that first impression might have colored my later thoughts, but I don’t know. What I do know is that the taste was a wonderful crisp sweetness with a round body to match. I have to say, this tea is aging well for what I heard was a bad harvest year. The aroma was cloying. I was reminded distinctly of a cup of apple cider as the first drops touched my tongue. After that I couldn’t shake the apple connection. The toasty, crisp cider character pervaded everything. I guess the next time someone asks for an Apple tea, I should produce this Bai Hao. 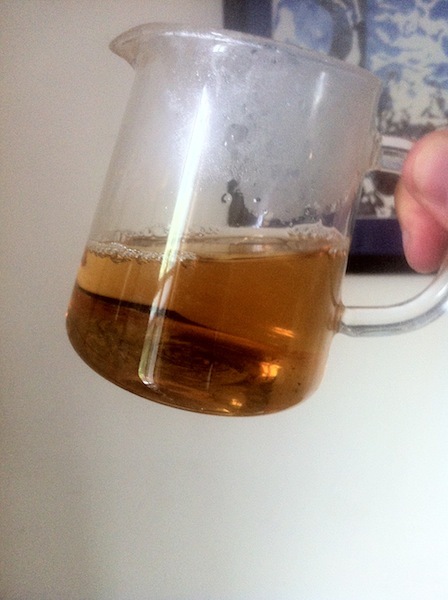 This entry was posted in Tastings and tagged baihao, camelliasinensis, oolong, taiwan on May 28, 2013 by payton. What a delight. The taste of honey and street roasted chestnuts. A full body and dark orange color that are as comforting in Spring as they were in Winter. This tea is Bai Hao or Dong Fang Mei Ren Cha (東方美人 – Oriental Beauty). I picked up this bag from Camellia Sinensis a few months ago at their recommendation. It’s definitely a classic Bai Hao taste and very welcome this evening. I was very pleased when I gave a sample of the fifth infusion to some customers at the tearoom and they immediately said that it tasted of honey. That’s exactly the flavor that I think best describes Bai Hao in general and so if someone who’s never had it before thinks of honey when it touches their palette, it must be good! The Bai Hao sourced by Dobra this season is much darker and even though I think it’s delicious, I’m much more reminded of a sweet Chinese black tea, perhaps an Anhui Qi Hong. I’ve read that the 2012 Bai Hao harvest was not very promising in general, due to weather conditions earlier in the year. I have high hopes for the 2013 season, but for now this is the tastiest Bai Hao I’ve had since the last of the 2011 passed us by. I easily got 9 infusions of honeyed goodness, making for a sweet night indeed. 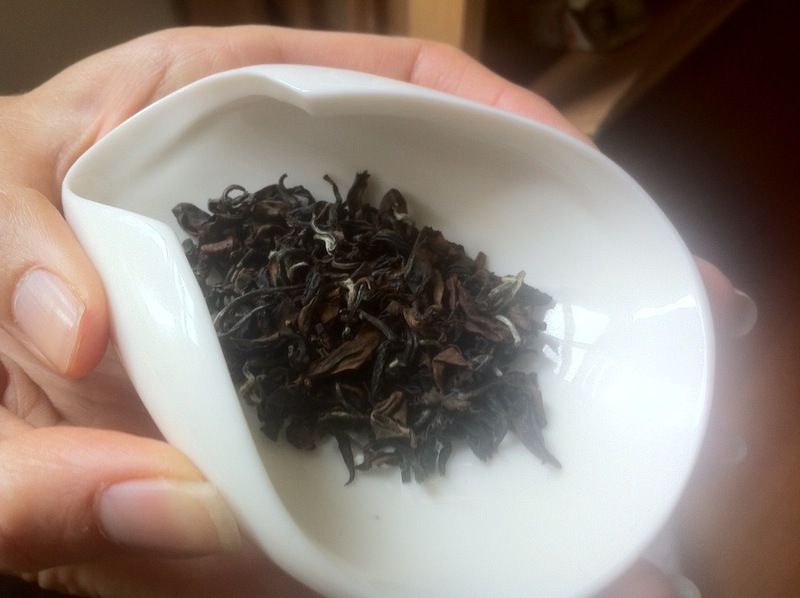 This entry was posted in Tastings and tagged baihao, oolong, taiwan, tea on May 5, 2013 by payton. Today’s tea was a gift from a tea factory I visited in Shao Xing (绍兴), Zhejiang province, somewhat near Hangzhou. We had traveled to the factory to learn more about the production of Zhu Cha (珠茶), more commonly known in the West as Gunpowder green tea. Zhu Cha is often considered a lower-quality style of Chinese tea, since its production is almost entirely by machine (a rarity in China), but one thing this visit taught me is that even such “low quality” tea has quite a pedigree. Most tea in China is picked by hand, usually early in the morning at high elevations. Zhu Cha is picked by a machine that looks something like a lawn mower, but is held up in the air over a row of tea bushes with a handler on either side. The tea leaves are sheared off into a collection bag on the back. For this reason you can always identify machine-harvested tea gardens by their immaculate rows of bushes. It’s worth noting that this style of harvesting is the norm in Japan, but that’s quite another post. The leaves are then processed through a series of machines. First they are heated in a drum drier to fix the leaf (this is what makes it a green tea).Then they are withered and rolled and heated in a series of steps to create the tiny pearls that give the tea its name. After our tour of the factory and gardens, we learned that from these gardens, there’s still a range of grades. Ping Shui Ri Zhu (平水日铸 – Ping Shui is the region), the tea we received, is apparently the highest grade of tea produced in that area. Ri Zhu tea is made earlier in the season than Zhu Cha (before April 20) at the same time as the local Long Jing, but the leaves are smaller and the processing is more akin to Zhu Cha. The leaves are dark green and rolled small, although not quite as small as Zhu Cha. The liquor is a pale gold and the taste is surprisingly sweet with a delicate vegetal quality. The aftertaste reminds me of a Sencha, actually, although its production is pretty far from that and there’s no corresponding aroma to make me think of Japan. In fact, there’s very little aroma at all. Energizing and quick, this full-bodied tea doesn’t have a lot of nuance, but is delicious to drink, especially on this sunny spring morning. This entry was posted in Tastings and tagged chinese, green, stories, tea, zhejiang on May 3, 2013 by payton.